Westfield pupils will enjoy a performance of Peter Pan this November. Around 200 children from across the North-east are set to enjoy the thrill of live theatre at shows and a workshop by a charity delivering opportunities that stimulate sensory awareness. Happy Days is using funding from Aberdeen Standard Investments’ Charitable Foundation to provide fairytale performances and African-themed music and dance workshop for young audiences with a range of conditions. Some 45 children from Fraserburgh's Westfield School will enjoy a performance of Peter Pan this November. The pupils, aged from three to 17, have severe learning difficulties and additional medical need. Ryan Sinclair, chief executive of Happy Days, said: “The very generous donation from Aberdeen Standard Investments’ Charity Committee will enable us to arrange shows in the Grampian area. "These are for young people who either have learning difficulties, ongoing or acute medical conditions and physical mobility or sensory impairments. 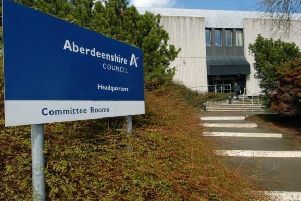 Claire Drummond, head of charitable giving for Aberdeen Standard Investments Charitable Foundation, said: “Through our charity partnerships we work with projects to bring benefits in the local communities where we operate.